We streamed into Ozawa Hall as the summer evening cooled and the sun lowered behind the lush lawns of Tanglewood in Lenox, Massachusetts. The wood-lined, shoe-boxed shaped hall, designed for prime acoustics, reminded me of a ship, and the audience members passengers embarking together. My friend and I sat alone in our row on the first balcony, hovering over the stage. As the ushers closed the doors, we faced the front of the vessel and waited for our captain to arrive. Pianist Garrick Ohlsson walked onstage, tall and substantial, dressed in a white tux jacket and black pants. Described by reviewers as “a gentle giant in the service of Chopin,” Ohlsson’s reputation as one of the finest Chopin interpreters began in 1970 when he won the Gold Medal at the International Chopin Competition in Warsaw, the only American pianist to ever do so. For this performance, the last in his season as 2017 Koussevitsky Artist, Mr. Ohlsson chose a solo program of Shubert and Scriabin, one he described in the program notes as an “odd coupling.” He found a thread between the two geniuses in the imagined career of Shubert if he had lived past thirty-two. A pair of Shubert sonatas bookended the program, as they bookended the last five years of Shubert’s life. Diagnosed with syphilis in 1823, he died of the disease, likely compounded by typhus, in 1828. These two sonatas express the beauty and anguish of his personal battle. The handful of Scriabin selections, some quite a bit more than a handful for any pianist, included etudes, a prelude, a tone poem, and the roller coaster ride of his Fifth Sonata. Placed between the Schubert, they proved to be a perfect counter point, opening a door to the musical future that the composer never lived to see, nor exert his significant influence on. From our seats we couldn’t see Mr. Ohlsson’s fingers on the keys, but better yet, we could clearly see his long, kind face. More than once during the recital, he looked right at us. Between one of the pieces, my friend whispered, “I feel like we’re his muses, as if our attention matters.” We felt within his circle of energy, if you can imagine one radiating from a musician of both greatness and humility, one whose powerful stage presence is the result of a long and successful career, a sweeping knowledge of the piano repertoire, and a transparent access to the emotional depth of the music he plays arising from his strength of spirit and intellect. His arc was wide and generous, fueled by his gift for penetrating, gently, of course, our emotional defenses. He calmly guided us to a place on the night ocean where one can lose sight of the familiar shore, a place where music can meet soul. The first Schubert sonata, No. 14 in A minor, expressed the composer’s torment when first diagnosed with syphilis, a terminal diagnosis at the time. Being Schubert, he could not help but offset the disruptive quality of the music with gorgeous melodies woven throughout all three movements, as if he was calling to him the beauty of life before he would leave it. This is most present in the third movement, where the melodies are interrupted again and again with disturbances in both tempo and tone. The Scriabin set spanned much of the composer’s artistic life. The pieces moved from the wandering dissonance of "Etude Opus 65, No. 1," to the jazzy, rhythmic flavor of "Etude Opus 8, No. 10." "Prelude, Opus 59, No. 2," marked “Savage, Belligerent,” lived up to its name. The painterly dreaminess of "Poème, Opus 32, No.1," was followed by the hair-raising ride of Sonata No. 5, Opus 53, which closed the set and left the audience ebullient in their appreciation of Mr. Ohlsson. Schubert’s last Sonata, No. 20, filled the second half, showcasing in four varied movements Schubert’s talents for lyricism, structure, harmonies, and counterpoint, as well as foretelling the direction toward modernism he would have taken if he had lived. Three curtain calls brought us three encores of short Scriabin etudes. I closed my eyes--I wasn’t always serving as muse, after all--and sank into the music. Infusions of sound and vibration entered my body at what felt like the cellular level. A thought crystallized in my mind: things fall way. I wasn’t thinking about Schubert at that moment. I wasn’t actually thinking about anything. I experienced a sense of release, as if locked-in patterns of emotional imprisonment were dropping. The image of four walls collapsing outward, as in a magic act, rose in my mind. This brought a deep, mysterious healing, one I cannot articulate or grasp the effect of, and left me with the sensation of being filled up, and lighter. I remember my piano teacher Maria Cizyk telling me about an audience member who sought her out after a performance to thank her. 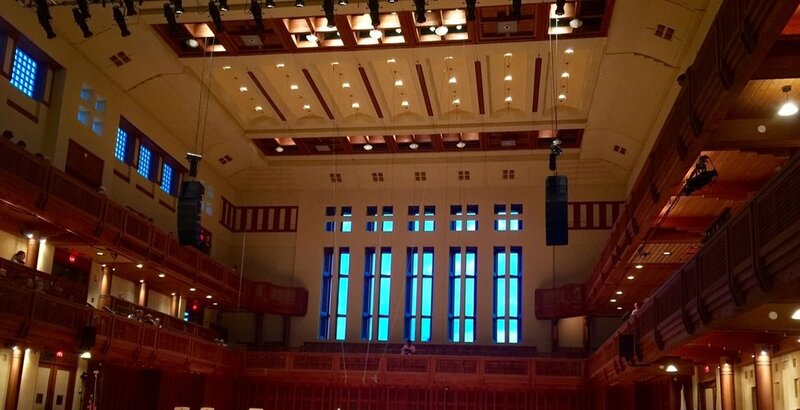 The woman said, “As I listened to you play, something inside me healed, something I didn’t know needed healing.” In Ozawa Hall, I understood what she meant. That night in Ozawa Hall we were passengers on a journey, guided by our trusted captain. Our price of admission was the willingness to be transported to an unknown place, to lose sight of recognized lands, and to allow unneeded things to fall away. Under the sure hand of Mr. Ohlsson, we arrived at the unseen shore, different people than when we set out.